As someone who has sensitive skin, I know what it’s like trying to find products that won’t irritate skin or cause a reaction. I need something mild that won’t bother me, but also a product that still provides an effective cleaning power on my clothes and personal items. Tide has recently introduced Tide Pods Free & Gentle, a detergent for people with sensitive skin that deep cleans without dyes or perfumes. I love the convenience of the pre-measured, single-use pac so you always get the right amount of detergent every time and no mess! 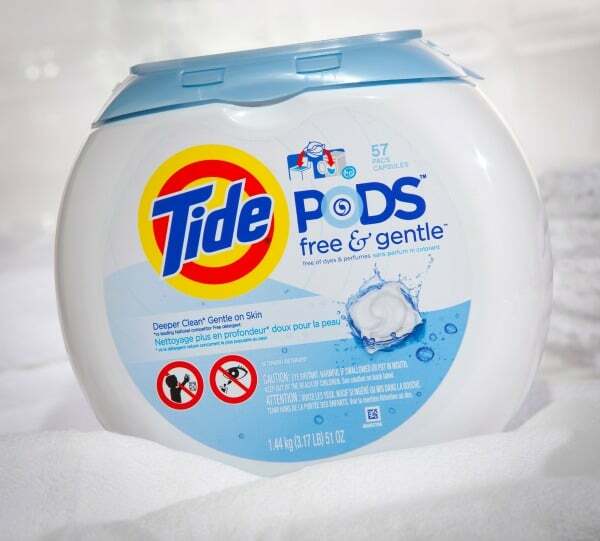 Tide Pods Free & Gentle Pods will dissolve in all temperatures of water and can be used in both traditional and HE washing machines. I wash my clothes solely in cold water (unless they are reallyyyyyyy dirty) so that is good to know! It also comes in powder, liquid and HE liquid for high efficiency washers. Dr. Sandy Skotnicki, a Canadian dermatologist, has some tips on how to prevent irritable skin. 1. Avoid fragrances and botanicals in your soaps, detergents and moisturizers as they can be both irritants and allergens. Try a detergent free of dyes and perfumes like Tide Pods Free & Gentle. 2. Stick to non-foaming “soaps” in the shower. They don’t strip skin of its natural oils. 3. Only shower or have a bath once a day since water dries out the skin. 4. Keep bathing times to under 15 minutes and avoid using hot water. 5. After bathing, pat yourself dry. Rubbing with a towel removes moisture and dries out skin. I was following most of these tips already except the one about hot water. I enjoy my hot showers! Connect with Tide, Downy and Bounce on Twitter. I seem to have the most sensitive skin in my family, made all the worse because it’s always been dry. I’ve recently developed sensitive skin. I have very sensitive skin and so does my 8 month old. Unfortunately, our daughter has always had eczema and we have had to be careful with what we use for the laundry. I am the one who has sensitive skin. Thanks for chance. I have sensitive skin would love to try this laundry detergent! This would be great for me. I’m trying to use less irritating cleaners on my skin because of my psoriasis. Have tried to enter several times, guess I am not a Tecky, lol. However, grew up in England with my Mum using Tide. Came to Canada in 1965 and continued using Tide. Hubby and I could not tolerate any other product on our skin; due to sensivity. We always recommend TIDE! My son has sensitive skin. I am the one with sensitive skin, so I have to wash my clothes separate from the rest of the family. This would really help me out for my laundry soap.